Guitar in hand, music from the heart, Australian singer and performer Rivkah Krinsky is the fresh new face of Jewish music for woman and girls alike. The traveling artist has been delighting audiences throughout North America and around the world. 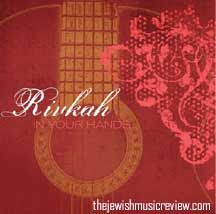 With her powerful voice and soulful tunes Rivkah captures her audience and inspires them to embrace their Jewish heritage. Her charming character, class and beauty both inside and out, make her interactive performances extremely enjoyable, as she breathes life and meaning into the words of each song.